The Sailor Moon anime and manga series of the 90s showcased mostly female superheroes called the Sailor Warriors. But the series has a male superhero character Tuxedo Mask. This article will be a Tuxedo Mask cosplay guide. Tuxedo Mask is one of the primary protagonists of the Sailor Moon series. Like the sailor soldiers, he also possesses a Sailor Crystal that gives him superpowers and the task to protect the Earth from evil. He uses his powers to aid the sailor soldiers in preserving the planet from the forces of evil. His private persona is Mamoru Chiba, and he is also the love interest of the main character Usagi Tsukino. Tuxedo Mask is the perfect character for males to dress up in if they are looking to cosplay characters in the Sailor Moon series. He is the only main male character in the Sailor Moon series who also plays a vital role in helping the girls. Tuxedo Mask is the disguise that Mamoru Chiba created for himself to hunt the Silver Crystal. When he encountered Sailor Moon in one of his hunts, his interest changed, and he now started following the sailor soldiers around, assisting them in their battles and giving advice along the way. He intentionally wears a mask on his disguise so his true identity won’t be given figured out. 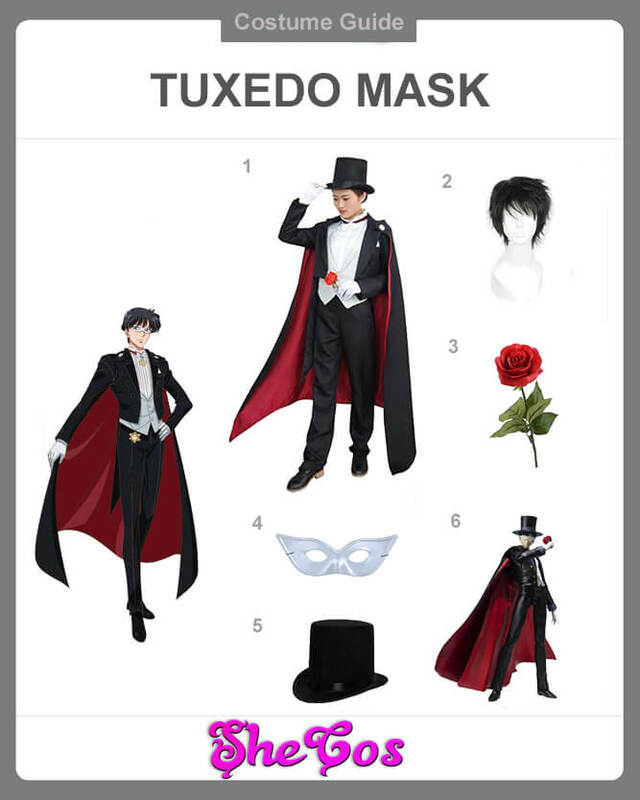 The Tuxedo Mask cosplay set comes with the full costume, which includes a black full-dress tailcoat plus a white dress shirt underneath and black pants. The collection also consists of a black cape lined with red, black leather shoes, a white mask that covers the eyes and a black top hat. The costume includes a short brunette wig for the character’s hairstyle and a rose flower, which the superhero uses to transform. The cosplay set also comes with a Tuxedo Mask figure. Tuxedo Mask is the only main male superhero character in the Sailor Moon series. He has psychic powers, which also includes healing and psychometry. Mamoru Chiba is the reincarnation of Prince Endymion, who died during the Dark Kingdom attack in the Silver Millennium era. As the series went on, he developed great chemistry with Sailor Moon when it comes to fighting, allowing their combination to defeat powerful enemies. 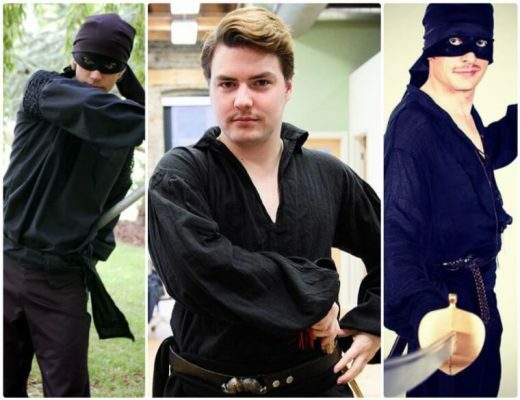 As the only male superhero, he is the only option for men when it comes to dressing up as Sailor Moon characters. 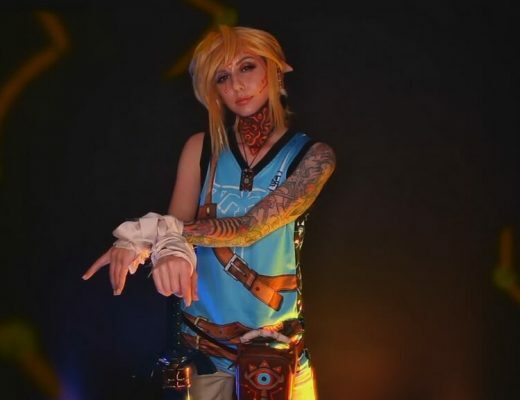 But if you look at the cosplay photos, there’s nothing wrong with that. As the female characters in the series, Tuxedo Mask is also a beautiful male character, and this can still be seen even if he is wearing a white mask to cover his face. 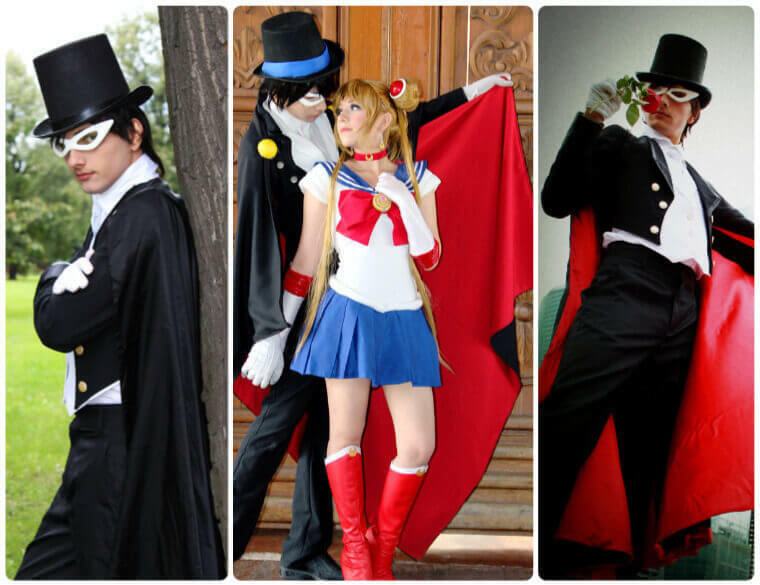 It is a great choice to cosplay in Tuxedo Mask, especially if guys have girlfriends or partners who can dress up as Sailor Moon. Their combination together looks perfect.